The beloved new Broadway production of Lynn Ahrens and Stephen Flaherty's Once On This Island has been named the 2018 Tony winner for Best Revival of a Musical! The announcement was made on June 10 at Radio City Music Hall. The other nominated shows in the category were My Fair Lady and Carousel. Once On This Island is playing at the Circle in the Square Theatre. "This is not how I expected this night to go at the beginning of this evening," said producer Ken Davenport. "This is a business where you hear 'no' an awful lot, so this award is dedicated to all the people who said, 'yes' to this production. Stephen Flaherty and Lynn Ahrens who said 'yes,' for this producer who 20 years ago got their house seats for them. To Paul Libin who said yes when we brought 1,000 pounds of sand, a hundred gallons of water, a goat and two chickens into his theater." "To our designers, to Camille Brown, our choreographer. To every single one of co-producers and investors who put money into this show, people who support the theater are the reason we all have a job, thank you so much. To the cast who performs tirelessly on that sand eight times a week," Davenport continued. "And lastly, to all the people out there who dream about doing what I do, what everyone else in this room does, do not stop asking your questions. It's amazing what can happen. You can get to your 'yes'!" Once On This Island follows Ti Moune (Hailey Kilgore), a peasant girl in the Antilles who falls in love with Daniel (Isaac Powell), a young man she saves from a car crash. 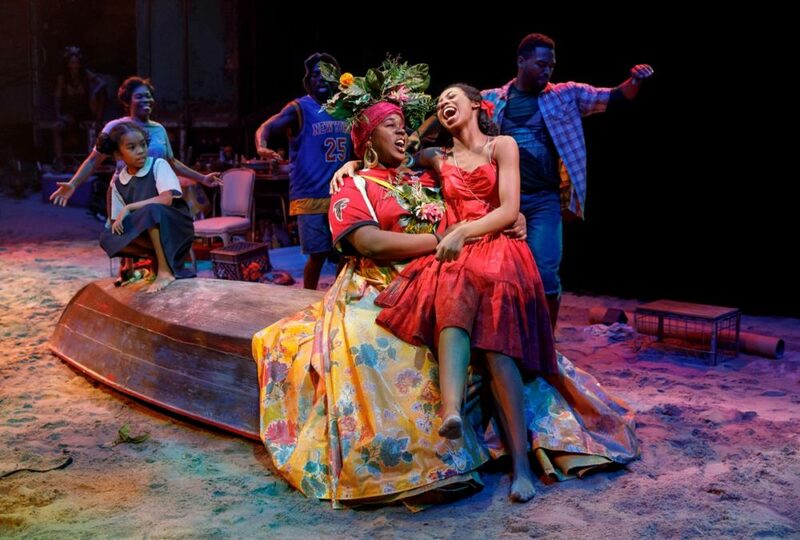 When he returns to his wealthy family on the other side of the island, four gods: Mother of the Earth Asaka (Alex Newell), God of Water Agwé (Quentin Earl Darrington), Goddess of Love Erzulie (Lea Salonga) and Demon of Death Papa Ge (Tamyra Gray), guide Ti Mourne through a test of her love against prejudice and hate. Michael Arden directs and Camille A. Brown choreographs the first revival of Lynn Ahrens and Stephen Flaherty's musical, which began previews on November 9, 2017 and opened on December 3. The show's cast also includes Isaac Powell, Phillip Boykin, Quentin Earl Darrington, Alex Newell, Alysha Deslorieux, Kenita R. Miller, Rodrick Covington, Cassondra James, Grasan Kingsberry, Tyler Hardwick, Loren Lott, Aurelia Williams, Emerson Davis, Mia Williamson, Darlesia Cearcy and Lea Salonga. Hats off to the company of Once On This Island on the win! Check out show clips from the imaginative revival below.